A few months ago Mark Shuttleworth, founder of Ubuntu Linux, called upon open source developers to surpass Apple and their wonderful MacOS-X based user experience. Well, gOS release 3 could be close to doing just that. They have taken the best of Mac OS-X and Linux to a level that the user experience of using it is, well, exceptional! I decided to give my three year old HP Livestrong laptop an OS upgrade. It has been running the default Windows XP Home edition all these years (with an occasional dose of Fedora every now and then). But this time round, I have downloaded the latest version of gOS live CD and used it to install it on the laptop. The installation went smoothly and I was able to install the OS in less than an hour. But as usual (as experienced with earlier Linux installs on this machine), it failed to recognize the broadcom wifi drivers. No sweat. I just plugged it into a LAN network and then used Synaptic Package Manager to find B43xx drivers. Which once installed, the card began working perfectly. The Mac users will notice the familiar dashboard at the bottom of the page. This critical and important feature replaces the navigation through cumbersome menus (found on Linux and windows) to find programs and applications and also takes care of the clutter of have multiple shortcuts (or launchers) on the desktop. The dashboard bar is completely customizable and I have already changed a few applications around to suite my needs using the Wbar configuration utility (that came pre-installed). gOS runs on top of Ubuntu 8.04, which is great as Ubuntu is already the best desktop experience available on Linux platform. Ubuntu claims to offer over 18,000 applications ready to install through its various repositories. I therefore, decided to install all the apps that I usually use on my regular Toshiba Ubuntu laptop and see if there are any glitches. The last time I tried doing that with gOS 2 (that I tested earlier this year), I encountered weird errors and some apps did not function too well. 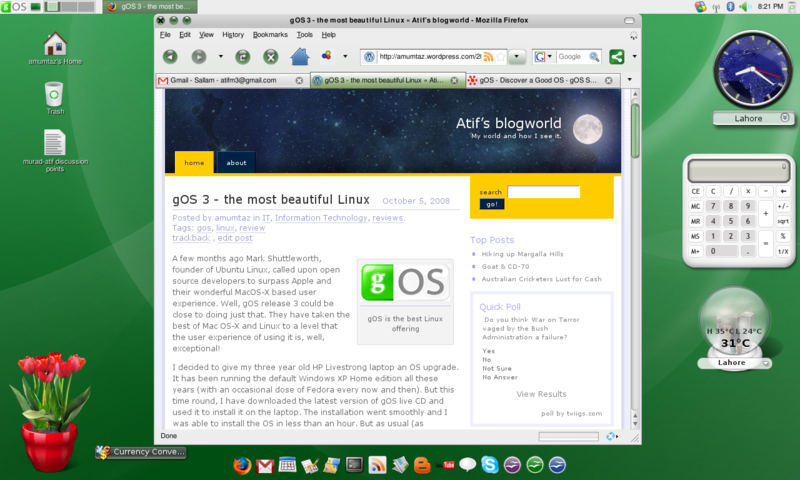 But this time around, the gOS team seems to have put in extra effort into integrating this OS with Ubuntu. The results are just spectacular as I seem to have no issues installing or running any app. My HP livestrong has an AMD 1.8 GHz Turion processor with 512 MB of RAM and 160GB of Hard disk (which I upgraded from 80GB recently for multimedia space). For Windows XP, the RAM is a bit of a drag and sometimes even the processor feels slow to run programs. But gOS takes less than 200MB of memory and usually never exceeds 300MB (when browser, openoffice, and other apps are simultaneously open). Thus the need to upgrade the laptop with more memory is not required. It has also taken about 3GB hard disk space for installing the OS which is quite efficient use of hard disk. My old machine has received a new life and I am utterly enjoying using it without any speed, or memory issues that I get from Windows XP. I do recommend that older machines should just switch to gOS rather than spending that money upgrading them. It also comes with two more innovations which I am beginning to enjoy. The first is Google Gadgets. By default, it lets users install and play with over 100,000 such gadgets that were so far available only to Windows users. I randomly installed over a dozen such gadgets to see if there were any integration issues. But so far, everything is working smoothly. Google Gadgets make it possible to personalize gOS so that it no longer looks threatening (to a novice computer user) as a Linux machine. The second innovation is the app called Prism. This application lets web applications run off the desktop. In fact, I am writing this blog using Prism on Google Docs from my desktop. This is a great experience. Prism lets us use all our favorite web apps off our desktop. Apps like Youtube, Blogger, Gmail, Google Docs among others. Even though gOS has no affiliation with Google, yet it seems to be eerily aligning itself to Google. All the Google apps (Google Docs, Youtube, Google Gadgets, Gmail, Blogger, News, Picasa etc) are natively supported and seem to point towards a complete Google experience. Over all, I give it a complete thumbs up and I recommend that everyone who is interested to use something other than Microsoft should give it a try. Especially those who cannot afford to buy licenced windows. As my earlier posts have indicated, I have moved to Ubuntu Linux as my default desktop. Many of you have been asking me if I have all the equivalent applications (as compared to Microsoft Vista) that I may require to do my work smoothly. 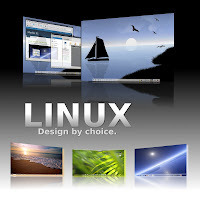 The answer is yes and here are some of the must have and essential applications for Linux. All these applications are in the open source domain and can be obtained easily and installed on your system. In fact, quite a few of them might come as standard applications when you install your new Linux Desktop. There are literally hundreds of other products out there, but the following are some of my favorite. This comes pre-installed with Ubuntu Linux. The application is quite similar to MS-Outlook. It includes Calendar, Address book, To Do list, Sharing of Vcards etc. This software supports all major IM clients including, MSN, Yahoo IM, Google Talk, AOL, ICQ, MySpaceIM etc. It also comes pre-installed with Ubuntu Linux. Skype is not supported by Pidgin. However, Skype itself offers a linux version. I downloaded it from their website. This is a great Office Product in the open source domain. It not only imports all MS-Word/Excel/Powerpoint documents but is even able to read their new docX extensions. It even lets you save files in MS Word/Excel/Powerpoint formats to share with your friends and colleagues who are still stuck with MS-Office. It came pre-installed with my Ubuntu Linux. Inspired by iTunes, it is one of the best music management application that I have come across on Linux platform. It will let you rip, burn audio CDs; import music from any device including USB and even supports internet radio. It comes pre-installed with Ubuntu Linux. There are a bunch of open source applications for photo management, but I prefer my Picasa. I downloaded it from Google’s website and it works great for photo sharing, management and organizing them. Firestarter is probably the easiest firewall configuration tool that I have found on Linux platform. It works well for desktops as well as servers and it will take you less than 5 minutes to configure it and get the basic services going. You can dowload it from the website and follow the procedure to configure it. For all those MS-Money or Quicken fans out there, here is an open source implementation of the money management application. It has all the great freatures of any major accounting package (for home as well as small business). A must have addition. Tomboy is a simple desktop note-taking application. It came with my copy of Ubuntu linux. If you are a fan of finding things on earth using google earth, then download its linux implementation from their website. Entrepreneurs should embrace Linux. Now, this may seem like a powerful statement. And it is. I have nothing against Microsoft or Apple or any other operating system out there. However, I do believe that among them all, Linux currently favors the biggest advantage to a budding entrepreneur. With Microsoft Vista and XP persistently scanning for counterfeit copies of their software (God knows what else) on your hardware, a small time entrepreneur in a developing country like India, Pakistan or Kenya will probably never be able to afford the licensed software. In Pakistan, Microsoft charges upward of PKR 150,000 annual license fee just to use their basic OS for a small enterprise. This price is equivalent of almost 6 months of salary of a fresh IT graduate from a good university in Pakistan. And then, the cost for all other softwares including IDE like Visual Studio or Dreamweaver and database servers can push the entrepreneur close to bankruptcy. This is acutely true due to lack of Venture Capital/Fun of bank financing for IT related companies in developing economies. Instead of seeking out the pirated editions of these robust softwares, my suggestion for budding entrepreneurs is to embrace Linux. Not just on the server side for launching applications, but also on the desktop where the actual development happens. The cost of ownership for all the software and applications will be zero. Yes zero, provided you stick to open source. In fact, most of the Linux applications are now owned or supported by large corporations including Linux by Red Hat, Oracle etc, MySQL by Sun Micro Systems among others. The development environments (IDE) are also improving including Eclipse, bluefish etc. Besides, chances are you will be using PHP, Java, Apache, MySQL and Sendmail on the server side for publishing your web application. All of them are native to Linux and come pre insalled and totally free. And did I mention, that viruses don’t cause as much havoc in linux as they do on Windows. And an industrial strength firewall software is also included free with the OS. Another major advantage of Linux OS over others is that it is not a CPU or memory hogger. Yes, my Ubuntu linux desktop uses on average 512MB of memory at any given time, even though I am running MySQL, Apache and a Firewall service on my laptop. This is a far cry from Vista (my laptop is dual boot) which uses a minimum of 1GB of memory for basic OS that does not even include any web or database server. Further, the CPU clock cycles are also consumed less by Linux. Hence, you do not need a top of the line system to do your programming or run a server. In one of the companies that I co-founded, Cogilent Solutions, we routinely run Linux on three year old systems and laptops with little or no glitches or upgrades required. So the cost of ownership of hardware is also lower. So don’t wait around, embrace linux in your enterprise and start seeking the benefits of the OS that can hold its own in front of Microsoft Vista. Has anyone tried the new Ubuntu Linux Desktop? Yes, instead of the usual Vista from Microsoft, the open source Linux? I did this week. In fact, I downloaded it out of a whim to see how what was this hoopla about Ubuntu. I am an old Unix/Linux fan and have had on occasions had Unix/Linux based machines as my desktop. So it was not my first try at this. But I must say, I was pleasantly surprised by what I saw. I partitioned my Toshiba laptop hard drive and assigned a small empty space to play with this new operating system. I had previously downloaded a copy of Ubuntu 8.04 Desktop Live CD and used it to install the OS onto my machine. The first thing it gave me was an option to load the OS off the CD and try it out on my laptop without actually installing it. Which I did immediately to see how my laptop would work. To my surprise, and a rarity for me, was that it picked up all the drivers easily. I have had issues with Wifi or display drivers or something in the past with various laptops, but not this time. Everything worked like a charm off the CD and I could even surf the web or do other things. The next obvious choice was to click on the INSTALL icon and let the installation commence. Once again, it was a smooth install. It recognized an empty space on my harddisk and installed Ubuntu in there with little or no input from me. In less than an hour, I was actually logged into the Linux system and using the usual softwares to do my daily chores. For office, it comes bundled with Open Office. In fact, once you get used to Open Office, you will not notice which software you are using (Microsoft or Open Office). I had Firefox as my browser and Rythmbox Media player. I even downloaded, Google Picasa (Photo Sharing), Google Earth and Skype from the respective websites and they all worked like a charm on the system. Even my USB flash drive was plug and play. And best of all, Ubuntu automatically mounted my Windows partitioned so I was able to access my files to work from Linux. Yes, all word, excel and powerpoint documents could be easily opened up from Open office and my music in itunes was quickly imported into Rythmbox to play. And for those outlook fans, Ubuntu comes bundled with Evolution email client. Which in my opinion is as good (if not better) than Outlook. Best of all, Linux processor and memory management is far superior to Vista as I was able to get better performance out of it. In fact, the Ubuntu persistently used 50% less memory for equivalent tasks as compared to Vista. And oh, if you are seeking any particular software for your personal needs, then Ubuntu has that option available through its package download management application. One can easily download, MS Money or Quicken’s equivalent in Linux, or DVD/CD Player, burner and ripper software. There are literally thousands of office, games, communications, programming, educational and accessories softwares to choose from. And the best thing is that all of them are free like the OS. So my verdict? I have decided to keep Ubuntu Linux as my default desktop. I will be using it to do my daily chores. There is still Vista on my system, but I am not likely to log into it in the foreseeable future. In my personal opinion of using various Unix (Sun Solaris, HP-UX, NeXTStep) and Linux (Red Hat, Fedora, Ubuntu etc) based Operation Systems, I have come to this conclusion that Linux has now matured enough to compete with Microsoft’s Windows and hold its own. Yes, it is now stable enough with large enough application support that one does not need to worry about any problems or issues. It is virtually as good as anything coming out of Seattle. In developing countries, like Pakistan, where it is quite difficult to purchase extremely expensive Microsoft products, this is a great alternative. It is cheap (free) and comes with all the goodies that one expects from the traditional operating system.